How to execute Unix/shell commands in a Perl script? When it comes to bioinformatics algorithms, Genetic algorithms top the list of most used and talked about algorithms in bioinformatics. Understanding Genetic algorithm is important not only because it helps you to reduce computational time taken to get result but also because it is inspired by how nature works. Genetic Algorithm was developed by John Holland. It use the concepts of Natural Selection and Genetic Inheritance and tries to mimic the biological evolution. It falls under the category of algorithms known as Evolutionary Algorithms. It can be used to find solution to the hard problems where we don’t know much about the search space. Let us understand how genetic algorithm works. For this, let us consider a cancer associated gene expression matrix. This matrix contains all the known genes found in human being and their level of expression. For a given problem, the genetic algorithm works by maintaining a set of candidate solutions and then applies three operators over them – Selection, Recombination and Mutation, which are collectively known as stochastic operator. Selection: In nature, if an organism is adapted to the environment, its population will grow relative to its quality of adaptation. This is referred to as selection. It means if a solution meets the conditional constraints, it is replicated at a rate which is proportional to the relative quality. 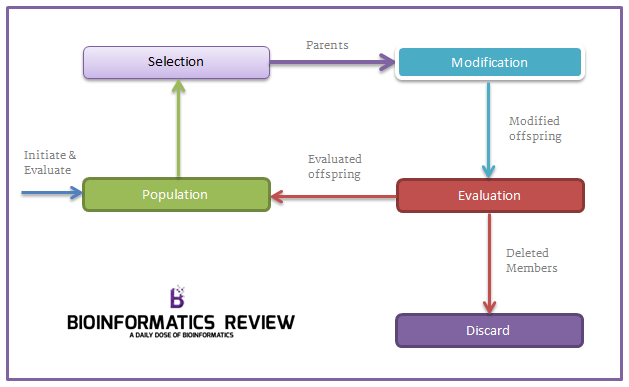 Have a look at the Genetic Algoithm illustrated in the diagram below to understand it more clearly. We are going to implement the Genetic Algorithm and write a program in Perl for it. Although not purely applicable to a real life problem, but it should be sufficient to familiarize you with Genetic Algorithm. Suppose that you had a set of Gene expression data. The data is for all 25000 genes in the human genome and you want to find out what are the five values among all 25000 values whose sum can give you the highest number. Recombine: It will form new combinations from existing chromosome by crossing them over with each other. That’s all! Feel free to comment and discuss if you have any confusion. Like this article? Share it.. ha?